Priority in collection development at the Institute Library has always been given to editions of texts and archival materials and to catalogues of manuscripts held in libraries around the world. There is a special strength in medieval philosophy and theology; but the collection is also very strong in history, law, liturgy, and literature. 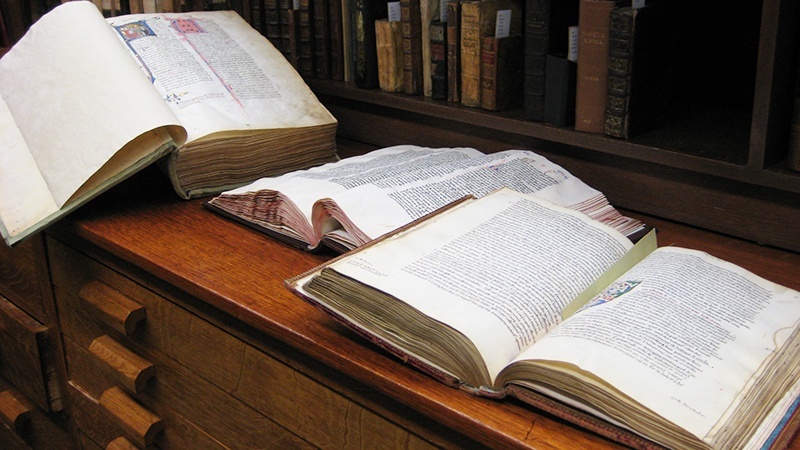 The published complete works of every major medieval figure, as well as the great multi-volume collections on national and ecclesiastical history, are all available in the Institute Library. about 500 books in various fields of medieval studies donated by James Carley and Ann Hutchison. The Gilson Collection, containing the books and articles written by the co-founder of the Institute (together with Henry Carr), comprises about 1000 items, including the several translations, editions, and reprints of his prodigious works. The items in this collection need to be requested for consultation. Call number designation: IMSG. The Maritain Collection comprises several hundred books by and about Jacques Maritain and his followers which were donated to the Library by the late Norah Michener, a graduate of the Institute. The items in this collection need to be requested for consultation. Call number designation: IMSM. The Guest Collection, nearly 4,500 books and pamphlets on the history and archaeology of English monasticism, is the gift of Dr. Gerald Guest. Along with 12,000 colour slides amassed during his visits to almost a thousand monastic sites in England over a period of thirty years, they constitute an exceptional resource. This collection is found in a separate room in the library and is freely accessible for consultation. Call number designation: IMST. The Roger Reynolds collection, nearly 1,000 books, over 200 microfilms, a few facsimiles, and several pamphlets on medieval canon law and liturgy, were donated to the Institute Library by Professor Reynolds’ widow Luba Reynolds in 2015. This collection is housed in a separate location within the Library and is freely accessible for consultation. Call number designation: IMSL. Catalogue of Manuscripts held in the Library’s “Joseph Pope Rare Book Room” (43 codices). Catalogue of Incunabula in the PIMS Rare Book Room (38 incunables). The Henry Carr Memorial Collection of microfilms and CD/DVDs of letters of the popes that are preserved in the Vatican Archives was initiated over fifty years ago by Father Leonard Boyle and Father Michael Sheehan. The Library has: the Registra Vaticana, the Registra Avenionensia, and the Registra Lateranensia. Henry Carr was a co-founder of the Institute with Etienne Gilson. The John Hine Mundy Collection contains about 16 meters of academic papers of the late professor of history at Columbia University. Professor Mundy, late professor at Columbia University, was a specialist in the history of medieval Toulouse as well as the Albigensian/Cathar heresy of the period; in military history and the history of warfare; and in urban history and the history of town planning. Besides the paper material there is also a large selection of maps, slides, photographs, microfilms, and CD–ROMs. A detailed catalogue is available. The Pamphlet Collection, assembled and indexed (authors and titles) by Ron B. Thomson, now houses circa 8000 offprints, lectures and pamphlets on topics related to the Middle Ages. Most of these items are not found in journals or other volumes in the Institute collection.